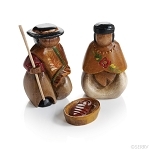 We offer beautiful hand made nativity sets from many countries in Asia, South America, Africa, India, Mexico, and even the USA. 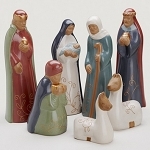 Magellan has one of the world's largest nativity scene collections nation wide. As Christianity spread, indigenous peoples, looking to generate more income, began to produce nativities to celebrate one of the most important holidays in the Christian calendar. The figures in the nativities are usually clothed in the manner of dress specific to the area, representing a melding of cultures.